So I was invited to lunch with my boss and her colleague to this lovely restaurant, just a five minute walk from the heart of the state’s capitol buildings. Sitti is an authentic Lebanese restaurant with a pretty view of the streets and a homely design. The menu was filled with traditional Lebanese food and even offers gluten free, vegetarian and vegan options. We were first given some kumaj bread, which is traditional flat/pita bread. 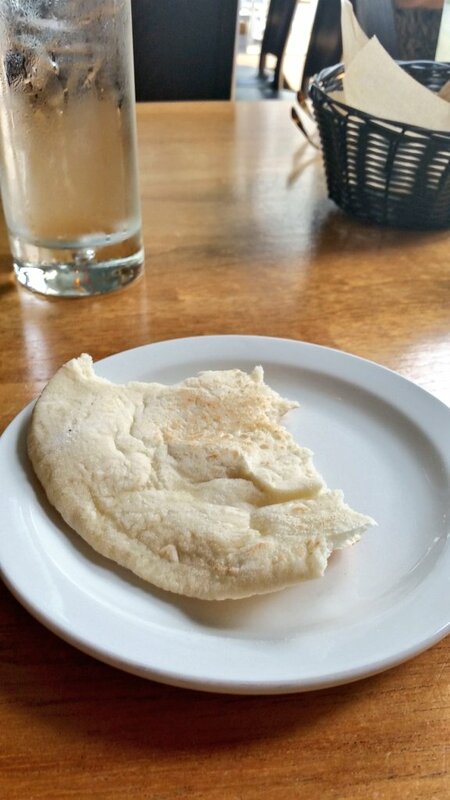 It reminded me a bit like Indian naan – it was soft and just a little crispy, but still warm and delicious. For lunch, I was boring and got the Sitti Salad which contained romaine lettuce, tomatoes, red onion and cucumbers mixed in a dressing blend of olive oil, lemon juice and dried mint. I also tried the falafel, a Middle Eastern dish made of mashed chickpeas mixed with various spices, all rolled into deep-fried balls. I was expecting it to be bland, but one bite showed me how wrong I was. It was spicy, tasty and glorious. Overall, it was a great experience and a mouth watering lunch – it’s safe to say I will stop by this little place again! You can find it at 37 S. Wilmington Street, Raleigh, NC.